Consider using Gaucho 15.5g Barbed Wire for your next project if you’re looking for a cost competitive barbed wire that is as strong as 12.5 gauge low carbon barbed wire but will last longer, requiring little to no maintenance. Gaucho Barbed Wire is made of high tensile wire which means even though the wire is smaller in diameter, it still maintains the same strength as conventional low carbon barbed wire products. 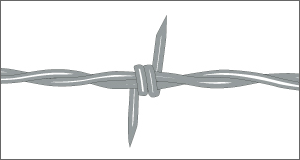 All Gaucho Barbed Wire products are manufactured by Bekaert. Gaucho is Class 3 galvanized which means it is proven to last two to three times longer than Class 1 and meets or exceeds ASTM A-121.